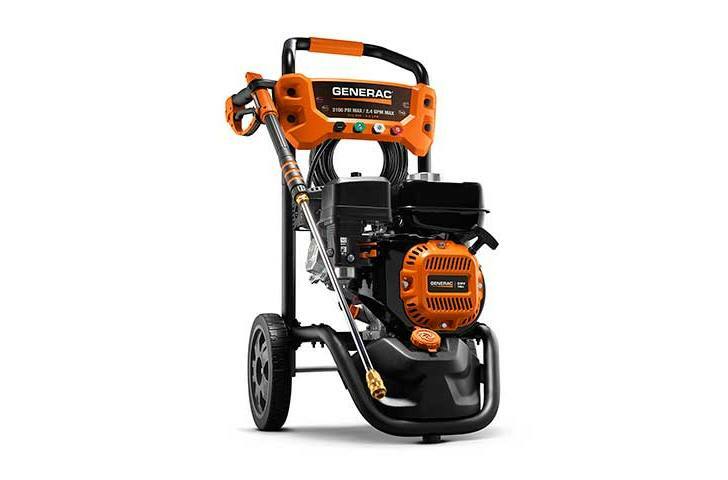 With its large Generac OHV horizontal shaft engine and easy-access axial cam pump, the 3100PSI power washer is ideal for cleaning everything from patio furniture to siding to decks around the house. Powerful 196cc Generac OHV Engine: Delivers maximum cleaning performance and reliability. Axial Cam Pump with Easy-Access Hose Connections: Easily make hose connections without having to kneel on the ground. Oversized Never-Flat Tires: Take your pressure washer anywhere around your home, regardless of the terrain. Ergonomic Spray Gun – Cushion grip extends use. Easy-to-pull trigger reduces fatigue. Quick-Change Nozzle Tips – Includes 4 tips: 0°, 25°, 40°, and soap applicator. User-friendly Controls – Easy access to engine controls - on/off, choke, and fuel shutoff. 25' High Pressure Hose – Connects to the rear of the spray gun for maximum convenience. Integrated Spray Gun Holder – Holds spray gun securely during transport and storage.